Epidauros (Arhea Epidavros) Photos of the theater at Epidauros. In the Argolid hills, between Nauplion and Krinidi, lies an ancient theater that was built into a hill and has a great view of the surrounding landscape. It also happens to face the Sanctuary of Asklepios. 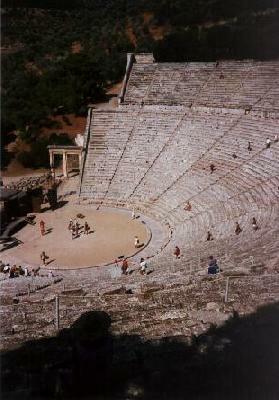 The theater at Epidauros was in fact part of the sanctuary of Asklepios. It was here that the cult of Askelepios had one of its two major sanctuaries. (The other one is at Kos). I will proved more information on the Cult of Askelpios below. 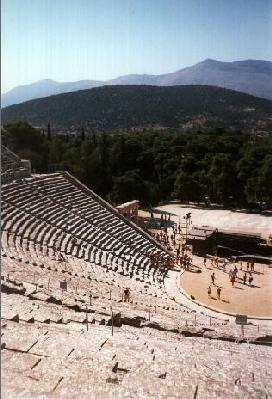 The main point of visiting this site is for the ancient theater. The theater, aside from having a great view, is said to have the most perfect acoustics in the entire world. People have tried to copy the effects but have failed. It is also quite a feat of engineering. Massive stone blocks have been laid on the hill to form the theater. The splendor of the site make plays here very enjoyable. 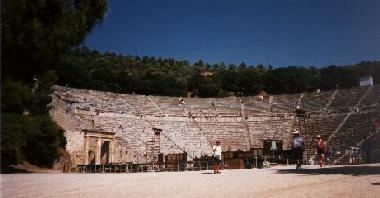 The theater was built around the fourth century and can hold 14,000 people. It fills up rather easily but leaving can be a bit drawn out. One unique feature is that it is divided into two parts, a lower, more roomy and a upper section (The cheap seats). The "seats" in the lower part are smaller (i.e. there is less of a space between the top and the ground) than in the upper part, most likely to accommodate a pillow. Thus the top is slightly steeper than the bottom, something that has been attributed to the good acoustics of the theater. The site though dates back much earlier than the theater though. It dates back to the six century B.C. According to mythology, Apollo (the god of the sun) and Koronis (a Boeotian princess) had a son, Asklepios. He was given to a goat to be suckled and then given to the centaur, (a beast with the lower half of a horse and upper half of a man with horns) Cheiron, to be given an education. (Apparently many of the gods gave their demi-god children to Cheiron for an education.) Cheiron taught him the arts of healing with plants and medicine. With this gift, and his own super natural gifts(after all he was a demi-god) Asklepios became a very skilled and knowledge healer. So knowleged he was able to raise the dead. This angered Hades (god of the underworld, and of wealth) because Asklepios was doing something normally reserved for the gods. So Hades went to his brother Zeus (ruler of the gods) and asked for something to be done. To appease the god, Zeus sent a "thunderbolt"(I think my book means lightning bolt though) and struck Asklepios dead. Apollo felt sorry for his son so upon Asklepios' death, Apollo made him into an immortal and a symbol for healing. Asklepios had amassed quite a cult following and the cult buried him in Epidauros, and set up his sanctuary for healing the sick. People from all over Greece came here for healing from his priests. When the Roman's came they brought more scientific healing methods and the sanctuary was abandoned. As you can see the theater is quite large. However it does fill up during the summer time because there are still plays held here. You can also see the lush green hills around it. 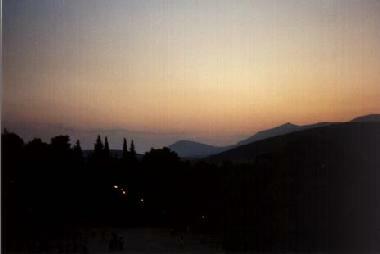 The plays are at night, and you get treated to nice sunsets as you wait for the play to begin. Corinthian Column This Corinthian capital was found wrapped and buried near the Sanctuary. 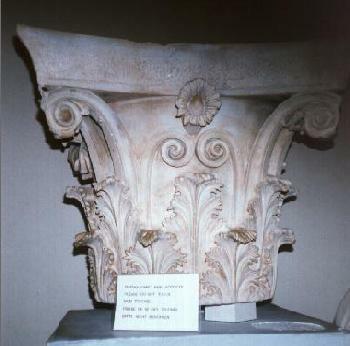 It is thought to have been a prototype for this type of capital because it differs slightly from those seen elsewhere and because of the care taken to wrap and bury it.